Microsoft Single Sign-on is Here! 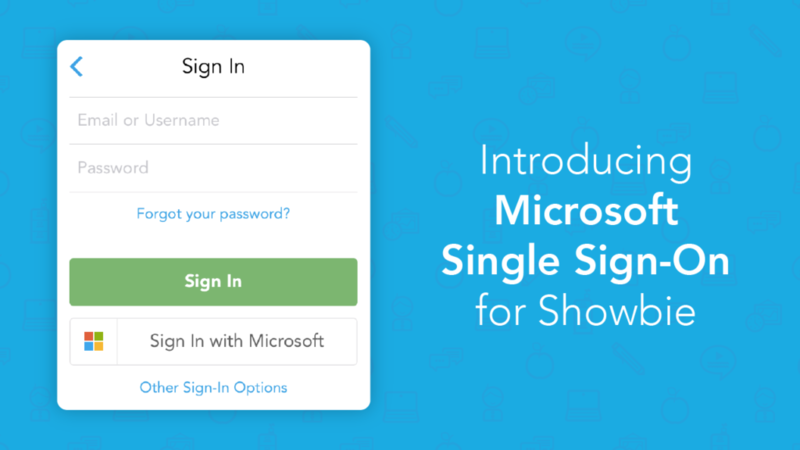 Sign into Showbie using your Microsoft account with our Microsoft SSO. Use Showbie’s annotation tools on Pages, Numbers, and Keynote files. Use Showbie’s annotation tools on Microsoft PowerPoint and Excel documents! Learn more. Add files from your Microsoft OneDrive account directly into Showbie! Learn more. Use Showbie’s annotation tools on Microsoft Word documents in the web app! Learn more. Toggle between your annotations and your students’ annotations with layers in the document previewer! Learn more. Search all your classes, assignments, and groups. Use Showbie’s annotation tools on Microsoft Word documents! Learn more. Use Apple Pencil’s double-tap gesture on new 12.9″ and 11″ iPad Pros. Learn more in the App Store. Resume writing comments if you accidentally navigate somewhere else before posting your comment. Undo and redo functionality is now available with annotations. Organize your assignments quickly through bulk actions with the Manage List feature. Learn more. Users without an avatar photo will have a colourful placeholder image that contains their initials. Create new assignments with default due dates that are saved as a cloud preference based on previous settings instead of always being set to one week from creation. Select and upload multiple images and files to Showbie. Upload differentiated materials to groups of students with Differentiated Distribution on the web app! Learn more. Upload differentiated materials to groups of students with Differentiated Distribution on iOS! Learn more. Use the pen and highlighter annotations tools on the web app! Learn more about the pen tool and the highlighter tool. Easily move assignments by right clicking or the three dots on the assignments to reveal organization options. Select text in pinned text annotations. Changes made to Class Folders in iOS will be reflected in the web app. Reply to posts directly from the notification without having to open the Showbie app. Cancel a co-teaching request if you no longer wish to join a class. Create, archive/restore and delete Class Folders to organize your Showbie account! Learn more. View Class Folders created on iOS. Version 4.0 (and later) is only compatible with iOS 10 (or later) devices. If you have an iOS 9 device, you won’t be able to download the later version. You’ll only be able to download version 3.8.x. Create Class Folders to organize your Showbie account! Learn more. Rewind, pause and fast forward with the new voice note recorder! Minimize pinned voice notes to avoid blocking document content while recording. Learn more. Version 3.8.1 is the latest version that will be supported by iOS 9 (bug fixes and improvements will be released version 3.8.x). Future releases from this version onward will only be supported by iOS 10 or later. Rename files as you upload them to Showbie from another app. Use the new highlighter tool! Learn more.